We promise to only send you helpful information about how to make your home search easier, more fun, and stress-free. Is your “perfect” home driving you crazy now? Moving is out of the question … you love your neighborhood and are SO ready to renovate your home! A home equity loan (or second mortgage) allows you to take a loan that’s based on your home’s equity plus other factors such as your income. Remember, the equity in your home is basically the difference in the home’s current market value and the balance left on your mortgage. Once approved, you get a lump sum and must repay a certain amount each month subject to a fixed interest rate, just like a first mortgage. Usually the length of the loan is shorter than first mortgages, five to fifteen years. Interest payments are tax deductible. Keep in mind, if you can’t pay back the loan, you risk losing your home. Also, you must pay back the loan in full when you move or you’ll need to get a new loan to pay back this loan. With a “line of credit,” you are approved for a certain credit limit based on your home’s equity. This loan functions almost like a credit card in which you can withdraw money when you need it over the lifetime of the loan, such as 10 years. You only pay interest on the amount you withdraw and not on the total amount approved. Interest rates are usually lower than credit cards and payments are tax deductible. Credit lines have variable interest rates rather than fixed rates so your repayments can change depending on the interest rate at the time you withdraw money. You should carefully review all requirements, fees, penalties and how often the interest rate is adjusted since HELOCs can vary depending on the lender. If you don’t have much equity in your home, you can consider a renovation loan. Many banks and lenders offer such loans. 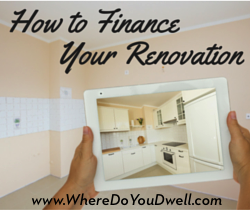 The lender bases the loan on what your home will be worth once the renovation is complete. This loan requires that you work with a contractor and not any DIY work. For this loan, you refinance your current home and add on the amount needed for the renovation to the loan. Rather than getting a lump sum directly to you, the lender is the one who pays the contractor as the work is done. Monthly payments on these loans are typically lower than credit cards or personal loans. Keep in mind that the interest is tax deductible but your mortgage balance will increase. This financing is similar to renovation financing, but lenders base the loan on what the home is worth now not when the renovation is completed. So you’ll need equity in your home. And since you’ll be refinancing, make sure interest rates are lower than your original loan. For this loan, your original mortgage loan is paid off and the amount needed for the renovation is rolled over into the new mortgage total. The amount needed for the renovation is given directly to you in one cash payment rather than having the lender pay the contractor. Remember that you never want to over-improve your home and end up being the best house on the street. Be smart about your decisions, especially for resale reasons, even if you don’t plan to move for a while. Also, don’t forget to consult with your financial advisor before you move forward on any type of financing. Make sure it’s the best decision for your situation. Each loan can have tax implications so you want to understand the complete process before undertaking any financing. As always, we’re here to help if you have questions about the housing market and what renovations can help improve the value of your home. We have really enjoyed owning our first home here in Arlington. Amy and Dwell were great to work with and helped guide us through our first home-buying experience! We are also happy that she was able to find us a home in the neighborhood in which we wanted to live. Get Your Free Best Seller! In life, change is inevitable. Jennifer’s chapter, “First, Decide That Success is the Only Option. Then, Do Not Waiver,” highlights how her own passion and belief in putting clients first helped her create a thriving business that she loves. Great First Time Buyer Condo! How Accurate Is My Zestimate? What Should Your Monthly Mortgage Payment Be? A Condo that Lives Like a Row House! “U” Will Love This Place! >Is Buying a Home Like Falling In Love?